Echinecea is an old-fashioned flower that has many different names such as Rudbeckia, black-eyed Susan, or cone flower. It is a hardy flower that people have frown in their gardens for centuries. This medicinal plant is still used to today to treat colds, flu, and ear infections. Many of us grow this beautiful plant in flowerbeds, or in our vegetable gardens. If you wish to have a jump-start on the season, begin the seeds inside. Toward the last week in February, or weeks before the last before the last expected frost date in your location, it’s time to plant the seeds. 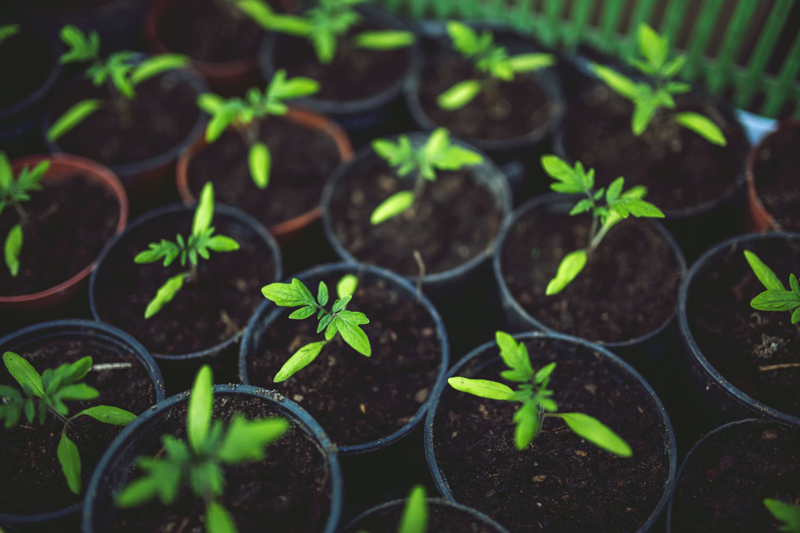 Grab a bag of seed starter soil and pour it into a bucket if you have only a small amount of soil or on top of the worktable for larger amounts. You need to moisten the soil before filling your cell packs, trays, or pots. When I moisten my soil on top of the worktable, I cover it with a tarp or an old plastic tablecloth. Pour the soil in a mound on top of the tarp or in your bucket. Sprinkle water over the top of the soil, mixing the soil with your hands. Only use a little water at a time or else you may have soggy soil. And you don’t want that. Test the soil to see if you have it the right consistency. Pick up a handful and squeeze your hand shut. Do you notice water dripping out or mud gushing between your fingers? If you do, then the soil is too wet. Open your hand. If the soil falls apart, that means you need more moisture, but if the soil stays in a compact ball, then you have it perfect. Place the 4-pack cells, or 2-inch pots into a tray or pan for easier carrying. Fill the packs or pots with the moistened seed starter soil. Bang the tray or pan against the worktable to settle the soil and collapse air pockets within the soil. Place one seed in the center of every cell or pot. Some folks will plant two or three seeds per cell or pot, and that is ok, if you don’t mind thinning your plants. I dislike pulling out healthy plants, because it just seems wasteful. Also, if you pull the plant improperly, it will harm the roots of plant that you left to grow. Push the seed with your finger so the seed coat is in firm contact with the soil. You don’t want to push it beneath the soil, because the seeds need light to germinate. Indeed to mention something here, because there are two schools of thought on where to put the seed tray. Some gardeners recommend that perennial varieties started indoors will have a higher germination rate when placed in a refrigerator for one month. After 30 days, bring the seed tray out and place it in a warm environment. Other gardeners will tell you that the seeds will germinate without placing them in cold storage. Maybe try it both ways to see which works best for you. Cover the cell packs or pots with a sheet of clear plastic. Place the seed tray in a window that receives indirect light and is warm. If you have a heat mat, set the temperature gauge to 70° Fahrenheit. A heat-mat works well for this because all you have to do is set the dial to the right temperature, and the heat mat will do the rest. Check the soil each day to check for moisture. If the soil starts to dry out, you will need to mist it with water in a sprayer bottle. Seed germination is sporadic so it can take between 5 and 44 days for the seeds to sprout. when the seeds germinate, take off the plastic sheet. Move the seedlings to a bright sunny window or if you have grow-lights, place them underneath those. Make sure that there is a space of 4-inches between the plant's leaves and the lights. If you planted two seeds or more per pot or cell pack, you will need to thin them. Wait until the plants have their second set of true leaves. Cut the weakest plant off at the soil line, leaving the strongest one. Continue to grow the Echinecea inside until all danger of frost is past. Before planting them outdoors, harden them off so they adapt better to their new growing location. This is done by placing the Echinecea outdoors in protected location for one hour. After that time, bring the plants back inside. The next day repeat this procedure, but leave them outdoors for 2 hours. Keep increasing their time spent outdoors by 2 hours every day over the course of a week. After that time, they will be able to handle being outside.